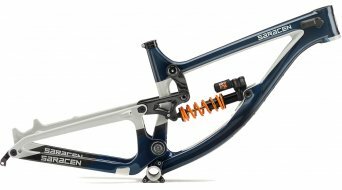 Here, you'll find mountain bike full suspension DH frames. 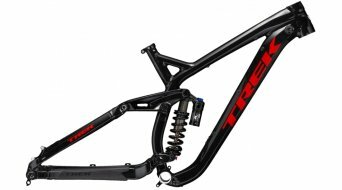 From the light carbon downhill race frame to the indestructible downhill machine with a lot of travel made of aluminium. Fully suspended downhill frames are designed to be suitable for toughest applications in terms of geometry, rigidness and durability. Furthermore, downhill frames most of the times feature a relatively low top tube and a low centre of gravity. Bike park visits or racing applications are the specialty, but downhill-oriented tours can also be managed by a full suspension DH frame. 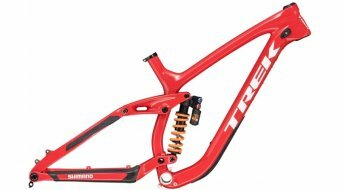 A relatively flat steering angle and a long wheelbase at modern frames for downhill bikes provide safety when riding fast and at the same time a good response behaviour of the suspension. The rear stay system for example can be single-pivot with or without deflection. Or it can feature elaborate deflections and four pivots. The response behaviour of the suspension, the braking behaviour and also the maintenance efforts are strongly dependent on the chosen system. Often, a virtual pivot point (VPP) ensures that the rear stay system is drive-neutral. This allows you to effectively pedal in spite of the large travel. The head tube on a DH bike is cone-shaped in most of the cases in order to take on and distribute high loads as well as possible. 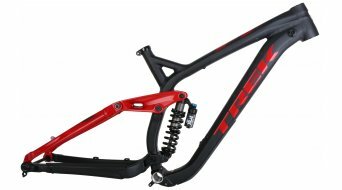 Discover our large offer at top prices in our shop for downhill frames.